The day broke beautifully as we jumped out of bed early and headed for the shower to get ready for one of the most important days of the school year. 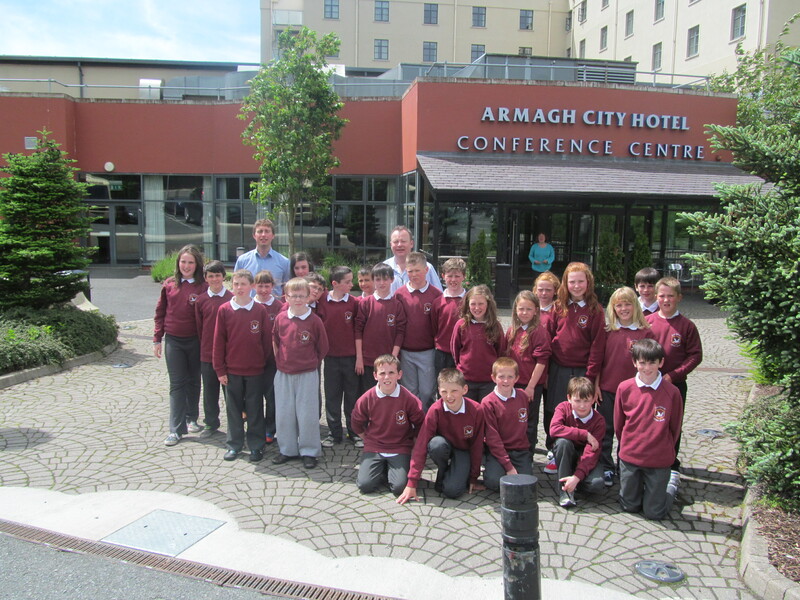 Our school, Scoil Cholmcille, Kilmacrennan, had been chosen as one of just four schools nationwide to take part in the Children’s G8 Summit to be held in the Armagh City Hotel. Each and every one of us had to attend school for 7:50am. Most of us were tired but the excitement of the day and the chance to meet new people knocked the tiredness away. Our teacher, Master Gallagher and our school principal, Master Devenney, made a final head count of twenty four pupils. With seat belts in place, we headed off on our journey. There we met the three other schools. They were St Mark’s Primary School from the Twinbrook area of Belfast, Gracehill Primary School from outside Ballymena and Griffeen Valley Educate Together from Lucan, Co. Dublin. Each school had prepared presentations on topics of interest to them. We chose Asylum Seekers and Refugees and Forced Evictions. Other topics discussed included Animal Cruelty, Food Poverty and The Impact of Globalisation in Poor Counties. After all the talking was completed, we got delicious food while talking and debating with the others schools. At half past one we had to say goodbye to our new friends. A picture of the whole group was taken to remember this momentous day. All in all it was a great day. We expected the summit to be a bit boring and academic but we learned loads. It really made us think of what is going on around the world. On the way home, we got a treat and our teacher told us he was very proud of Kilmacrennan National School and its pupils. We arrived home at 4pm exhausted but it was worth it. 5th Class pupils in Kilmacrennan N.S. were delighted to learn recently that they are one of only four school’s nationally to have been chosen to participate in the first ever All-Ireland Children’s G8 Summit. The prestigious event will be held in Armagh this Friday, 14th June. It is a great opportunity for the children to debate issues of national and global importance to them. They look forward to engaging in challenging debates on the day. They have been busy preparing for the event and will set off early on Friday morning armed with laptops, powerpoint presentations, fiddles, accordions etc!